As a member of the American Association of Professional Landman since 1980, and achieving ‘Certified Professional Landman‘ status in 1991, David Klym’s mission is to provide the highest standards of ‘Landwork’ for its clients and to encourage sound stewardship of energy and mineral resources. 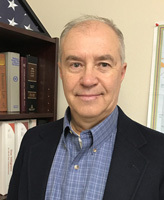 David has extensive experience of over 38 years throughout the Rocky Mountain Region and various other states while working on Federal, State, Fee and Tribal Lands for a number of major oil companies and Independents. Expert witness’ status at Oil and Gas Commission hearings. How can we help you? Please contact us to discuss your project!